I'll start off with saying that typically, these kinds of posts don't fare well on my blog. But do I care anymore? No. I want to create content I love to read, so that's what I'm gonna do. Lately, I've been loving my daily browse of whowhatwear, and figured I should be writing more about what I love. Here goes, my list of fashion trends to keep an eye on in 2019 (but only the good ones, imo). 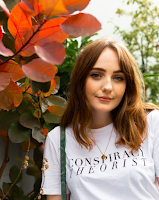 Seeing as it's only January, we can't really predict ~all~ of the style trends 2019 will throw at us, because as we know, Instagram has a habit of bringing up trends from nowhere. But as it stands, these are the trends we'll all be wearing this year. I have skipped a few from the trend reports, like neon and sarong skirts, because in all honesty, they're not my vibe (lol, catch me wearing a neon sarong skirt come June), so I guess you can think of this as a list of trends I'll be incorporating into my wardrobe in 2019, that you might like too. They're cute, they're classy, they're everywhere in 2019. From classic hair bows in all kinds of fabrics (hello, velvet) to small additions to tops and dresses alike, bows will be taking over this year. The best part about this trend is, it's fairly cheap to get on board with. Just top up with one or two small accessories or make your own out of some ribbon - this trend could end up costing you less than a quid. As you can guess from the name of my blog, I'm pretty excited about this 2019 tie dye trend. This good old DIY technique will be a trend of its own, but plays a part in the surf trend that's set to be in style this year. Finally, we can all live like Ivy from 90210. Maybe. Of course, sustainability isn't really a 'trend', it's more of a movement (we hope), but I thought it important to include in this list of 2019 fashion trends. This year, I predict we'll be seeing more and more sustainable options, not just on our high street, but with small independent businesses. The very nature of small businesses usually equals slow fashion, so here's hoping both these 'trends' grow. Not only will sustainability be around through the very nature of how things are made, but in their appearance, too. More natural fabrics and fibres like cotton, wool and silk will be prominent on the high street this year I think, as well as handicraft techniques like crochet and macrame. I'm here for it. The 70s trend is going nowhere in 2019, and this translates through a good old warm toned colour palette. We saw these colours take over the makeup world a couple of years ago, and now it seems our wardrobes are full of them, too. Burnt oranges, creams (not whites), deep greens and warm pinks. Bring them on. 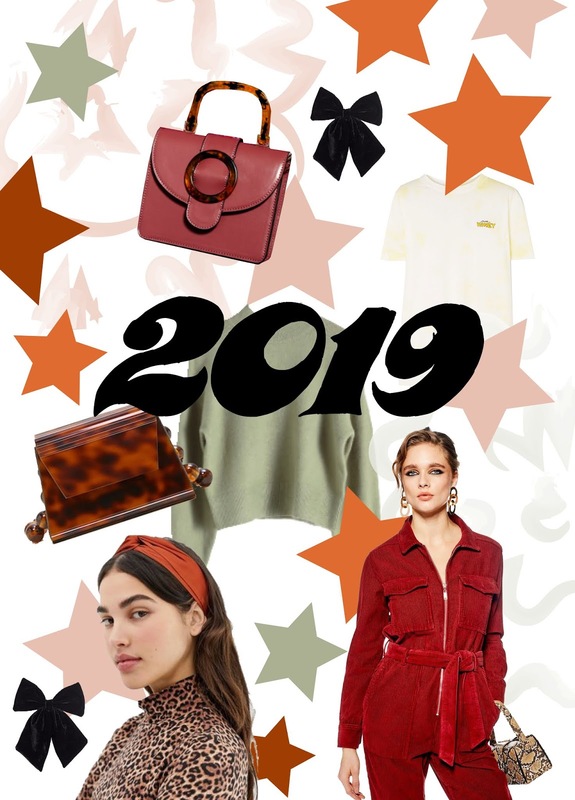 Before the clock even struck midnight on NYE, fashion editors everywhere were calling sage green fashion's colour of 2019 (alongside Pantone's living coral, obv). I can already see this pistachio-esque colour donning the tribe of London-based Insta girls, paired with pearls and teeny tiny bags, can't you? One of 2019's micro trends, if you will, but I can see satin sticking around from late 2018 into 2019. The midi satin skirt was arguably *the* most Instagrammed piece of clothing last year and it's here to stay. Not only for our bottom halves though, satin tops and hairbands are already filling up the shelves. And what was often paired with those satin mini skirts on the gram? Hair accessories. Or more specifically, hair clips. I'll bet these will remain a huge trend in 2019, alongside the bows I mentioned earlier, hairbands and honestly, who knows what else. If it goes in your hair, it's gonna be trendy. They may be slightly more expensive than the clips you used to rock in primary school, but accessories brand Valet is the place to go for hair clips this year. On that note, a lot of these hair clips seem to be adorned with diamonds (ok, diamantes) and pearls, which look like they're going to be around for a while to come. I think they'll spread further down the body too, with belts, anklets (yes, anklets) and even on shoes. We've already seen those gorgeous pearl-esque beaded bags trickle their way down from high end, and my guess is this will continue in 2019. Hardly a brand new trend, I know, but mini bags are 100% here to stay in 2019. They just seem to be getting smaller, and in many cases, more oddly shaped. Practical? No. Pretty? Yes. Another, but the final, microtrend of this 2019 trend list - patterned tights. The eagle-eyed amongst you will have seen these doing the rounds on social media lately, ranging from Gucci hosiery (imagine laddering them!!) to good old spotty 80 deniers. Whatever pattern or price range you choose, you're onto a winner. Sophie Milner recently did an IGTV video on how to style them if you're stuck. There you have it, my run down of 10 of 2019's biggest and best fashion trends. I know this kind of post might not be everybody's cup of tea, but I love reading them, and I love making them, too. If you enjoyed this, please let me know, and maybe share with someone else who's into this stuff too. *affilaite links are included throughout this post. All opinions are my own.